We are excited to announce the third installment of the band’s Wheels of Soul Summer Tour. This year TTB will be joined on all dates by longtime friends and collaborators The Wood Brothers and Hot Tuna. The tour is scheduled to hit some of the country’s premier outdoor venues on the most ambitious Wheels of Soul tour to date. After four consecutive sold-out shows at Red Rocks for TTB, this year’s tour adds a second night at the illustrious Colorado amphitheater, with special plans in the works to make both nights unique events. Beginning in 2015, the inaugural Wheels of Soul tour featured Doyle Brahmall II and the late beloved Sharon Jones and her Dap Kings. The collective energy of the tour would often times amass in a 30 person encore of Sly Stones’ “Sing a Simple Song / Higher,” that the Denver Westword called “a wall of talent on stage.” Following 2015’s success, the 2016 tour took the platform to new heights, bringing North Mississippi All-Stars and rock legends Los Lobos on the road. The Oakland Press deemed Wheels of Soul 2016 as “the best musical hang of the season…a celebration of kindred creative spirits,” and few could argue with that. With members of all band’s joining each other’s sets, the 2016 tour took on a traveling festival atmosphere, something few other tours could emulate, and something fans can look forward to in 2017. Call-in number: Call the hotel directly at (303) 278-6600 to make a reservation by using the group name: Wheels of Soul Tour – Tedeschi Trucks Band. Book Online: Visit www.denverwestgolden.hamptoninn.com. Select your dates, then click on "Add Special Rate Codes" arrow. Next, enter the Group Code “WOS”. 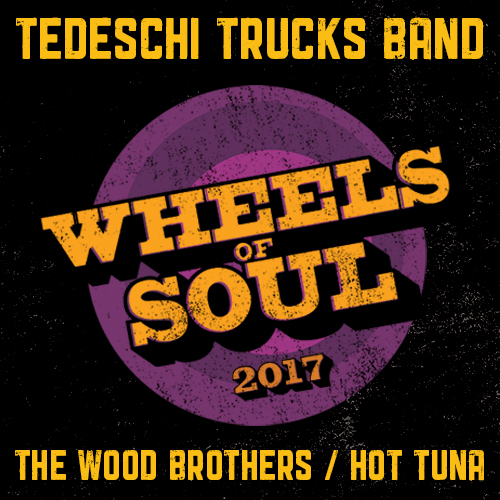 Call-in number: Call the hotel directly at 1-800-325-3535 to make a reservation by using the group name: Wheels of Soul Tour – Tedeschi Trucks Band.